This solar shower allows you to take a refreshing shower in your garden or by your pool before or after swimming. The shower easily connects to your garden hose, then through solar energy it heats the cold water up to 140°F for a perfect outdoor shower. A faucet is included to adjust the pressure and temperature, and the shower comes with 4 screws to mount the base to any flat solid surface. 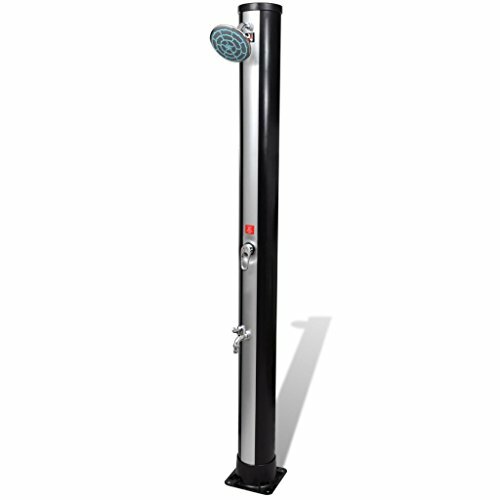 With a neat and modern appearance, this solar shower will be a great addition to your garden or your swimming pool. Total size: 6.3" x 6.3" x 77"
This solar shower, built with a 9.25 Gallon water tank, soaks up the solar energy and heats the water inside. With this eco-friendly shower you can enjoy a refreshing shower outdoors with sun-warmed water before and after swimming. This solar shower allows you to take a refreshing shower in your garden or by your pool before or after swimming. The shower easily connects to your garden hose, then through solar energy it heats the cold water up to 14¡øF for a perfect outdoor shower. A faucet is included to adjust the pressure and temperature, and the shower comes with 4 screws to mount the base to any flat solid surface. With a neat and modern appearance, this solar shower will be a great addition to your garden or your swimming pool. If you have any questions about this product by Anself, contact us by completing and submitting the form below. If you are looking for a specif part number, please include it with your message.